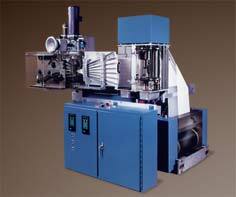 The DLN-300 Napkin Converting System is manufactured by GGA Packaging. The DLN-300 Napkin Machine System is a fully automated napkin converting and placing system. The system is designed to maintain low linear tension on the paper stock, reducing chance of web break. Machine cross fold capability employs low pressure air jet tucking with no moving parts. The outfeed rolls, which control the placement, are cantilevered from one side of the frame to allow o-ring changing without disassembly. Also, they raise easily to allow immediate access for maintenance.